When you are working with hazardous and flammable substances it is important to always keep safety in mind. Furthermore, it’s important to consider explosion-proof only machinery, when purchasing equipment to use with such substances. Explosion-proof means that a machine or device safely contains sparks and prevents explosions if sparks are created. Dangerous chemical fires and explosions are avoided by explosion-proof machinery. Another term used to describe such devices is ‘intrinsically safe’. This means that the machine in question cannot produce enough energy to even cause a spark or flame. The best way to avoid dangerous chemical fires and explosions when working with hazardous and flammable substances is to use explosion-proof equipment. It’s as simple as that. The risk of fire and explosion around flammable substances must be taken extremely seriously. Lives and equipment are at risk always when potentially dangerous materials are present. Using equipment that is not meant to prevent catastrophes with hazardous materials can result in fire or explosion. This can hurt people, property, equipment, and merchandise. Products that are labeled explosion-proof follow the National Electric Code definition of explosion proof apparatus. An explosion-proof industrial platform scale must be able to withstand an explosion caused by gas or vapor / prevent an explosion from occurring. This explosion can occur within the apparatus, but it should not be able to escape through sparks or flashes. It will protect people and other nearby equipment from ignition of flammable substances near or on the scale. The Occupational Safety & Health Administration created the National Electric Code (NEC) to provide a system of classifications based on how materials are handled in a number of environments. They also set the standards for the safe installation of electrical equipment and wiring in industrial facilities. The NEC classifies each location using three criteria: type, condition and nature. Materials being handled at every potentially hazardous location are taken note of, along with how each substance can become perilous and flammable characteristics. The type of scale you need is a durable, well-made, and strong explosion-proof industrial platform scale to measure large containers and drums of flammable materials. Using an explosion-proof industrial platform scale is one of the best investments a person can make when working with flammable and other hazardous substances. Safety is the No. 1 priority and using the proper equipment for whatever type of job you are doing is the best way to stay healthy and reduce the chance of accidents, injuries, and deaths in the workplace. Your best option is a platform scale that is explosion-proof and intrinsically safe. Furthermore, keep your workplace up to code. Meet the safety standards to protect the livelihood of your employees and materials/products/property. An explosion-proof platform scale from Arlyn Scales will keep your work area safe and reduce the possibility of catastrophic fires and explosions. You’re protecting your people and your business with explosion-proof scales. A standard industrial scale can use up to 120 volts of electricity when in use. If a scale that uses this much electricity were to be used in a hazardous location, the consequences could be fatal—it’s certainly unsafe. The smallest spark of electricity in a location where flammable or explosive materials are present could easily result in a fire or explosion, which would put the safety of nearby equipment, merchandise, and human lives at risk. ArlynGuard scales operate on a significantly low level of electricity. The internal microcontroller components in Arlyn’s explosion proof scales are designed to work well with low voltages and high-quality load cells. Stainless steel load cells are used in Arlyn’s intrinsically safe industrial scales because they are more durable than aluminum and they are fully compatible with low power scales. Explosion proof scales by Arlyn Scales get their power from a rechargeable C cell battery. The scales do not rely on external electrical cables plugged into the wall. The battery is kept in a sturdy holder on the scales so it cannot be susceptible to wear and tear. The holders are made from machined aluminum and if there are ever any excess electrical currents detected, then the holders prevent the batteries from releasing electricity. ArlynGuard scales come with replacement rechargeable batteries. 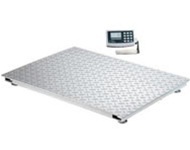 2 spare batteries are provided by Arlyn Scales with the purchase of an ArlynGuard scale. The batteries must be charged and recharged in a safe area, away from hazardous materials. To further avoid potential fires and explosions in hazardous environments, every component and wiring length in explosion proof scales by Arlyn Scales is designed to prevent electrical shorting. ArlynGuard scales are designed to reduce the possibility of electrical surges and shorts, which could lead to harmful ignition.